It has always been difficult to stand-out in a crowded market. When the products you sell are also available from thousands of other vendors at the same or lower prices, how do you differentiate your business and convince customers to buy from you? Smart companies surprise their customers when customers least expect surprises. When you deliver what people expect, but add a surprise, you can create something unusual. People love surprises. People remember unusual. People talk about unusual. And most importantly, being unique sets you apart from your competitors. 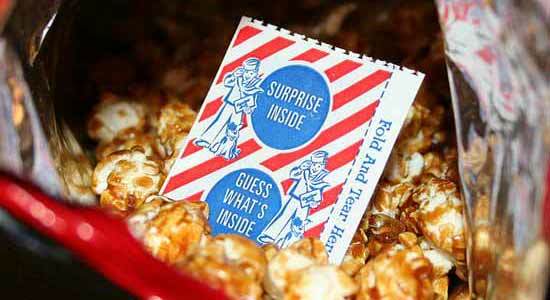 Why should you consider adding surprise as a marketing tool in your business? Zappos (one of the most popular online stores for shoes) tells customers to expect an order within 4-5 business days. However, Zappos often surprises customers by shipping items to be delivered the next day. Zappos doesn’t charge extra for this service and doesn’t tell customers in advance that it will upgrade their shipping. But customers are delighted when they get their shoes the day after they placed their order. Customers not only talk about their delight on social networks, but also love the experience so much that when they next purchase shoes, they will again buy from Zappos. What does it take to make you happy? Not much. A classic study by psychologist Norbert Schwarz found that ten cents would do the trick. He and his cohorts repeatedly placed a dime near a copy machine where they knew it would be found. When the subjects who found the dime were surveyed shortly after their discovery, their overall satisfaction with life was substantially higher than other subjects who did not find a coin. You have a similar opportunity to create a positive emotion and associate that emotion with your brand. For example, when a buyer posts a project on crowdSPRING, I email them, thanking them for their business. The email also offers a few tips on how they can get the most out of their project. The email is automated, but I include my email address and direct phone number. Most customers are surprised to hear from a founder, and even more surprised when the founder encourages them to send an email or pick-up the phone and talk to the founder directly. Some customers respond with a thank-you note or a question. Others call. An email from a founder is a small way that crowdSPRING personalizes our conversations with customers, and we’ve been thrilled with the many conversations the email has facilitated. Companies need to invest time in understanding their customers and in creating surprising aspects in – or around – the product/service delivered. But it does not need to be huge and expensive in order to be surprising. Adopting a ‘surprise’ strategy thus requires a careful analysis of the costs and benefits (e.g., in terms of increased sales, increased profit margin through customer retention, and reduced advertising costs) of such a strategy. It should also be kept in mind that the same ‘trick’ will not surprise forever because the schema a consumer holds is likely to be updated. However, little variation can keep the suspense (Pine and Gilmore 1999) and continue to surprise. Surprise marketing can backfire. Lindgreen and Vanhamme found this could happen when “the illustrations and/or descriptions [of the benefits] lead customers to build a schema divergent from reality”, such as when a “valuable free gift” turns out to be a fifty cent item. A different problem can develop when the surprise works too well: customers come to expect the surprise every time. For example, customers might come to expect free overnight shipping every time when a company surprises them with overnight shipping for their first few orders. What creative surprises have you seen from companies? Do you agree that small surprises can have big results?